ARTOGRAPH® Super Prism™ & Prism™ Projectors The Prism™ and Super Prism™ projectors have become the standard for the discriminating artist, crafter and designer. They offer increased performance and special features to make scaling artwork and designs faster and easier than ever before. The general purpose Prism™ projector is ideal for projecting all varieties of high contrast art, patterns and designs. It features an optically ground 200mm lens that both enlarges, up to 20 times and reduces, down to 80%. The Super Prism™ is perfectly designed for excellent image clarity and accuracy. Featuring two lenses: the Super Lens (240mm) is a 3-element color-corrected lens for extra sharp images from challenging originals, such as photographs or highly detailed designs. This precision ground lens offers enlargement from 3X to 20X the original size. The accessory lens adds reduction capabilities down to 80%. Both projectors feature an exclusive 7" x 7" glass top-loading area with removable cover that accommodates most copy including oversized artwork, books and 3-D objects. Illuminated by 2 250 watt photo bulbs for a whiter, brighter image (included). Fan cooled and thermally protected to keep originals cooler. UL approved, 5 year warranty. Made in USA. 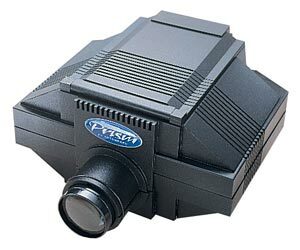 Copy aperture – 7" x 7"
ARTOGRAPH Super Prism & Prism Projectors The Prism and Super Prism projectors have become the standard for the discriminating artist, crafter and designer. They offer increased performance and special features to make scaling artwork and designs faster and easier than ever before. The general purpose Prism projector is ideal for projecting all varieties of high contrast art, patterns and designs. It features an optically ground 200mm lens that both enlarges, up to 20 times and reduces, down to 80%. The Super Prism is perfectly designed for excellent image clarity and accuracy. Featuring two lenses: the Super Lens (240mm) is a 3-element color-corrected lens for extra sharp images from challenging originals, such as photographs or highly detailed designs. This precision ground lens offers enlargement from 3X to 20X the original size. The accessory lens adds reduction capabilities down to 80%. Both projectors feature an exclusive 7" x 7" glass top-loading area with removable cover that accommodates most copy including oversized artwork, books and 3-D objects. Illuminated by 2 250 watt photo bulbs for a whiter, brighter image (included). Fan cooled and thermally protected to keep originals cooler. UL approved, 5 year warranty. Made in USA. Copy aperture - 7" x 7"